BEI Sensors introduces the T-Series industrial inclinometer, a compact and high performance sensor for measurement of slope or tilt angles of an object with respect to gravity. The T-Series uses advanced MEMS technology, which offers the best combination of precision and responsiveness for todays industrial marketplace. The new inclinometer series offers a wide range of motion feedback including dual axis up to ±60° or single axis of 360°, with resolution of 0.01° and accuracy of 0.1°. Incorporating built-in linearity and temperature compensation; both for offset and sensitivity, makes this one of the highest performing MEMS-based sensor available. 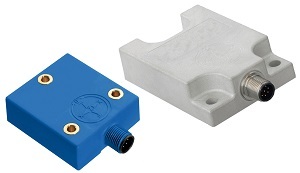 This tilt sensor provides outstanding mechanical stability with a completely encapsulated sensor and a glass fiber reinforced plastic or an AW6082-T6 aluminum alloy housing. The plastic housing is manufactured with automotive grade UV resistant material with UL 94 V-0 classification for safety of flammability. Available output options include 4-20mA or 0.5  4.5V for a simple analog interface, or a CANopen output for ease of integration into existing bus systems. Its compact design and simplicity make it extremely robust in high shock and vibration environments. Designed for harsh outdoor applications, these easy-to-mount inclinometers are sealed up to IP68. When properly mounted, with a sealed mating connector they can even withstand IP69K washdown environments. The T-Series is ideal for tilt measurement applications on industrial equipment such as mobile cranes, forklifts, drilling towers, construction and agricultural machinery.